That was a final reflection from Mike Setterington of EDI Environmental Dynamics Inc., during his presentation at an April 3 session called “Are caribou at risk of extinction and will the Nunavut Land Use Plan save them?,” at this week’s Nunavut Mining Symposium in Iqaluit. 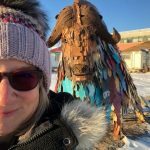 Inuit in western Nunavut have also maintained that caribou have a history of movement and that the land use plan restrictions would stop mining on their own Inuit-owned lands, which cover about 100,000 square kilometres, even where there are no caribou. But the decline in barrenland caribou is marked: they numbered more than two million in the early 1990s. Today the current population of barren-ground caribou is estimated at about 800,000. While most subpopulations have declined dramatically, two have increased, the Porcupine Caribou Herd and the Southhampton Island herd. But several of the largest herds have declined by 80 per cent from peak numbers, according to the most recent assessment from COSEWIC. The “caribou crisis” dates back to the 1960s and before then, and sparked government imposed restricutions such as prohibiting the use of caribou to feed dog teams and relocating communities away from caribou herds. As it stands now, mines cover .006 per cent of Nunavut, or about 13,000 hectares, said Setterington, who during his career worked for the Government of Nunavut in Arviat as well as on the caribou section of the environmental impact assessment for the Mary River mine in north Baffin. He’d also like to see provide convincing evidence on a case-by-case basis that protection is the only way of ensuring herd health and that other measures are not working. Not mentioned in this presentation is how he is a gun for hire for industry. His only clients are mines & he has made a career representing development. Does anyone really think that a mine in the middle of a calving ground is a good idea? Ask any other caribou biologist. Or better yet go ask elders. If the threshold we are talking about is if caribou are at risk of extinction in Nunavut, we’ve already lost. Why do you assume that a biologist who works for an NGO or environmental protection group opposed to industry wouldn’t be just as biased? I live on Baffin Island where there is not enough tuktu to go around now. While my hunt for this species is heavily regulated, the mining companies can go mine the calving grounds of what is left of the herd. I am not up For hormone ingested foods for life, so lets give the herd a chance and protect the bit of land the tuktu need to recover properly. This is the least we can do for a great source of nutritional food we have been blessed with since time immemorial. Perhaps this isn’t biased at all but a presentation of some facts to consider?!! I didn’t notice a pro- industry or anti-industry statement in the presentation, it’s intent, or the journalist’s summary of the presentation. Are tuktoo at risk of extinction on Baffin Island? Yes, caribou are at risk. Anyone who has lived here knows that. This report only shows a scientist being stupid. The Nunavut Mining Symposium is about 3 things, greed, money and mining. These people absolutely do not care about Inuit, their lifestyle and the environment. It’s intended goal is to basically water down what their true intent, then achieve support from a selected group of politicians who have the authority to make the world turn in their favor. I liken these folks including the politicians who fall for their schemes to President Snow (Hunger Games). Your Inuit reps under the auspices of the regional associations have fallen for this as well. It is a bleak future for the protection of your identity, your lifestyle, and the one animal that have provided sustenance to many of you, the caribou and its environment. Your are correct, it’s about the money. It is called doing business. Companies who give to charities, before putting their business needs first, will not make it. Keeping culture alive is one thing, running a business, is another. Can you combine both? Of course, you can. 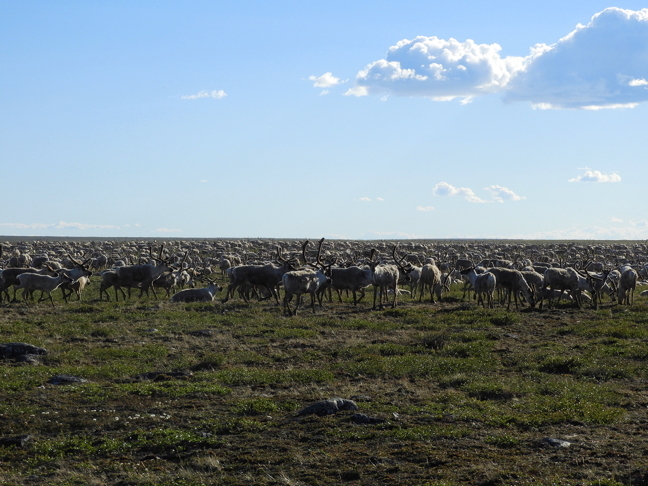 Having limited caribou in the Baffin can also be associated with over-harvesting. With respect to Baffin caribou that were abundant in late 1990s to early 2000, the fact is it wasn’t over harvest that most biologist would like you to believe. Those herds crossed over to Baffin over to and moved back to the mainland was the result of fewer caribous on Baffin Island now. Not over harvest is the result. – there, fixed the headline for you. We need our tuktu so that our kids kids can still hunt. tuktu do shift there range.. and if anything i think this statement means we should protect more area because perhaps an area that has no tuktu right now might be the habitat they need in 50 years… however if a mine is built there then they wont be able to use that area then. And we should be the ones to say what can be done on IOL, and i think right now we need to protect tuktu calving and migration routes. 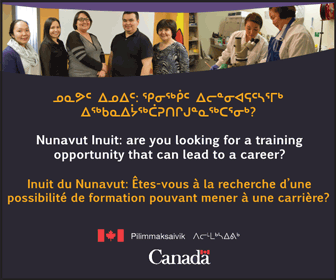 When we get to the point that every inuk that can work is working and there are even more that want to work but no jobs available then lets consider mines that could impact our tuktu, but not before them. Right now anyone that wants a job can get one… after they put time in training. Tuktu Nogak Park to protect the calving grounds of the Bluenose East herd. They then moved and started calving closer to the diamond mines and exploration. No calving there now. Ukkusiksalik National Park partly to protect the calving grounds of the Wager Bay herd. They then moved and started calving closer to diamond exploration and a major iron project to the north. No calving there now. A Critical Wildlife Area created for Bathurst Caribou years ago. They then moved and started calving way to the west, closer to diamond mines and a new mine development. No calving there now. 3 real examples, among others, of this problem. And what is the end result? No protection, no development, No choice. 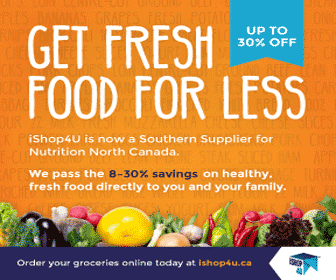 Smarten up Nunavut. There is a better way. Kivalliq had mobile protection measures for decades that were found effective. Kitikmeot wants the same. The mainland of Nunavut had this almost figured out before the preservationists stepped in. The southern preservationists that riddle Nunavut governance will not listen. It is their agenda in force in Nunavut today. What a bunch of duped patsies we are – many of us have bought into their ideology hook, line and sinker. So much so it is only the pro-development people who actually want to get something done that can see and speak the truth, and then get hammered for it. Time to purge the preservationists and get something in place that really works for people and caribou. 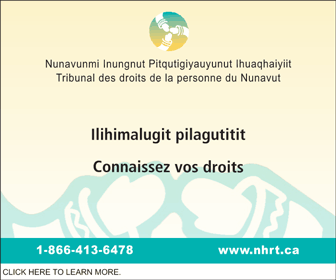 Where do NTI and regional Inuit orgs stand anyway? One of the most significant parts of the land claims agreement is the creation of the Institute of public systems (NWB, NIRB, NWMB, NSRT & NPC). Providing representation, a voice for Nunavutmiut & the recognition of a traditional lifestyle that needs protection. The Inuit orgs should instinctively know a blanket protection method is best for a lifestyle & animals requiring vast amount of space to thrive & survive, even Setterington knows this. But, he can’t admit it because of the people writing his pay cheques. The Inuit org staff on the other hand should be jumping at the chance to refute articles such as this, instead pretend to play politics give-in for handouts, crumbs from the dinner tables of the govt. By the way, Mike Setterington is a bird expert, he is not a caribou biologist.